General Characteristics: Tall, erect, stocky, maturing within 9 to 12 months, producing from 3 to 10 oha; distinguished by practically self-green petioles. Petiole: 100 to 140 cm. long, medium green slightly tinged with reddish-purple at apex, pinkish-red at edge, a red ring at base with light pink for 3 to 4 cm. above. Leaf blade: 45 to 60 cm. long, 30 to 40 cm. wide, 35 to 45 cm. from tip to base of sinus, narrowly sagittate, slightly concave, medium green; margins with a few large undulations; piko small, light purplish; lobes obtuse with medium-cut to fairly deep sinus. Corm: Flesh white with pinkish tinge, especially near apex, and yellowish fibers; skin light to dark pink. Inflorescence: Peduncle light green; spathe green on lower tubular portion with faint purple areas at base and at constriction, the upper portion yellow. 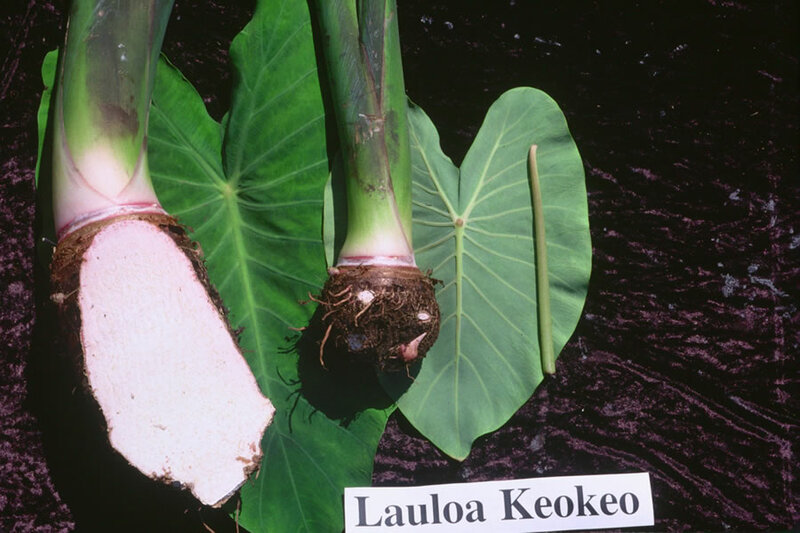 Origin, and derivation of name: Native variety; this is the lightest colored of the Lauloa; hence the name Keokeo. Distribution: Widely distributed throughout the islands, almost exclusively in the uplands, but especially common in Kona, Puna, and Kau, Hawaii. This variety is probably the most important of the Lauloa. Use: Used primarily as a table taro.